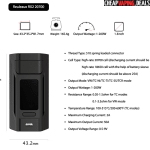 Check out these cheap deals for the Wismec Reuleaux RX2 20700 Box Mod. 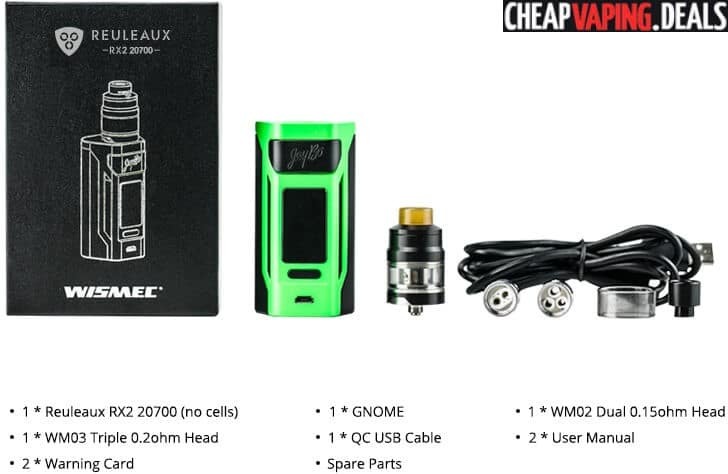 This mod has massive power and works with two 18650 batteries or more powerful 20700 cells for long vaping times. 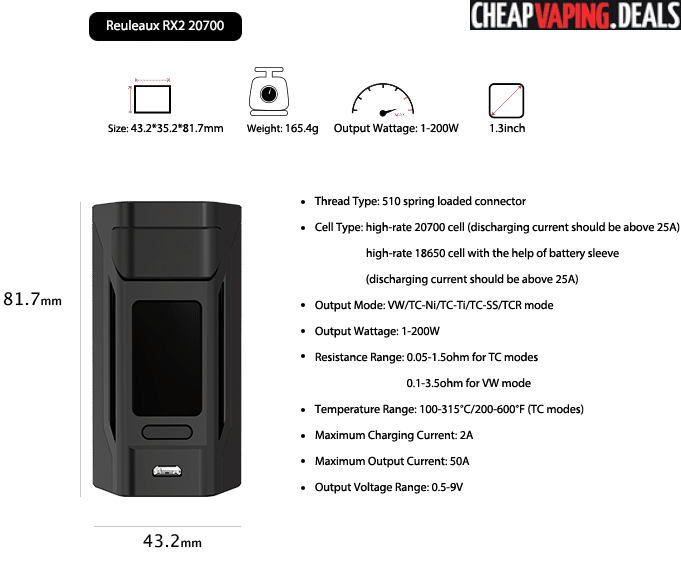 As the name implies, the new Wismec Reuleaux RX2 20700 utilizes better performing 20700 batteries, but also works with 18650 cells. 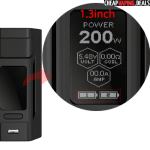 Additionally, the new mod features a large 1.3 inch display, an easy to use interface, 200 watts of output, temperature control with TCR, fast 2A charging and a compact design. 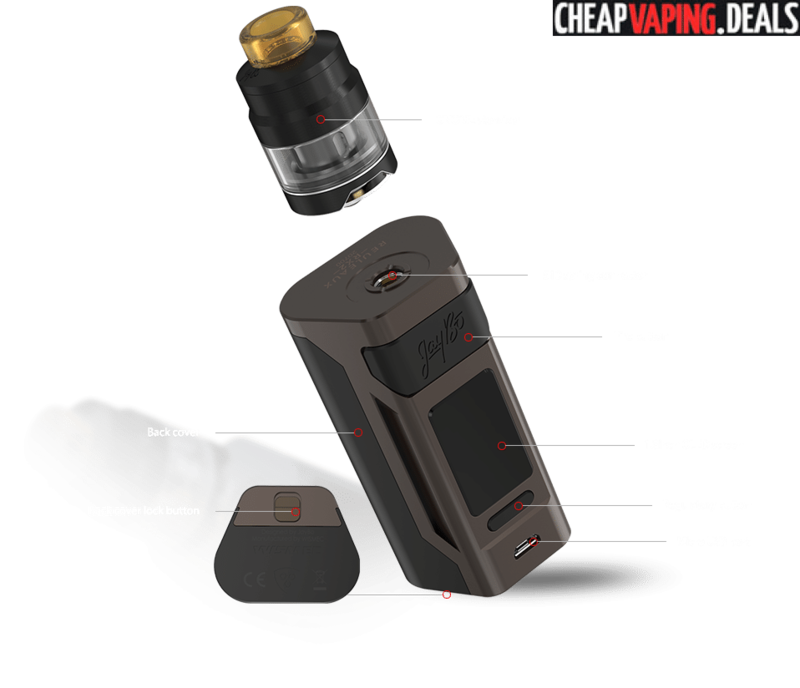 In the appearance department, this new mod looks an awful lot like the RX Gen3 Box Mod. Just like it’s more powerful brother, the RX2 20700 is made from zinc alloy, has an ergonomic feel and is easily transported thanks to dimensions of just 43.2mm x 35.2mm x 81.7mm and a weight that comes in at only 165.4g. 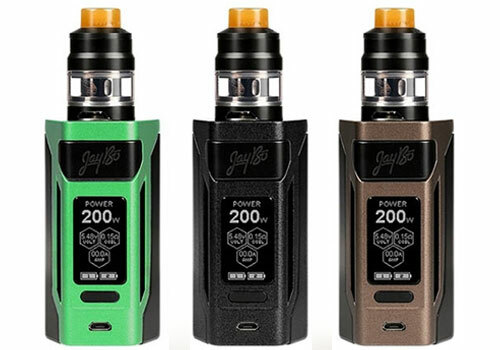 Available in fewer colors, the new mod can be obtained in either black, green or brown. At the top, you will see a 510 spring-loaded connector for perfect atty installation. On the control face, there’s a 1.3 inch OLED display with an identical menu at the Gen3 because of Bespoke firmware made specifically for RX devices. 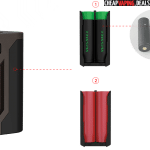 Vape data is vertically oriented and includes indicators for mode, wattage output, temperature output, atomizer resistance, amperage and dual battery bars to track charge levels in each cell. 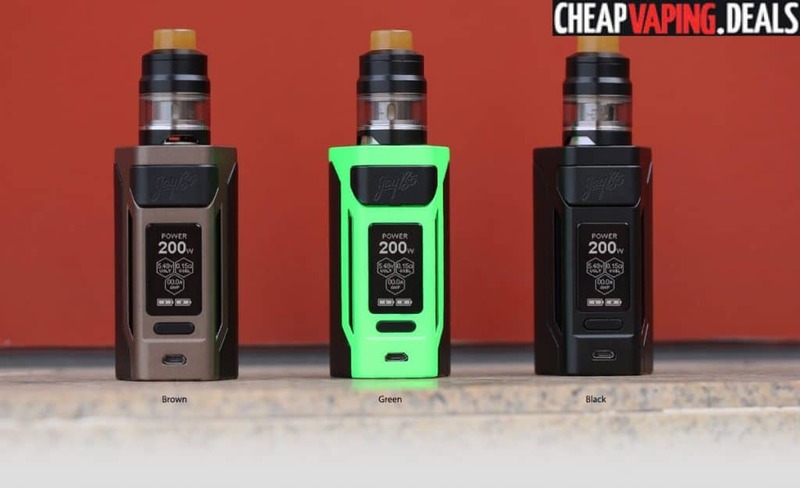 Powered by dual 20700 batteries, the Wismec Reuleaux RX2 20700 Mod’s vape times can be up to 40% more as compared to 18650 batteries. If you don’t have the more powerful batteries, you’re in luck as the new mod is also compatible with 18650 cells with the included sleeves. Accessing the battery bay is effortless as the back cover simply pulls/slides off for fast replacement. 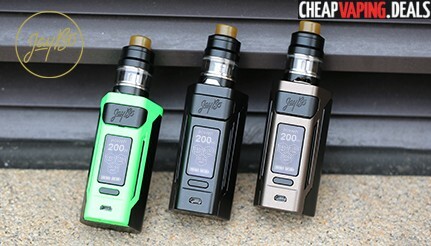 Or, you may choose to charge the batteries while they are inside the mod by plugging it into any computer or micro USB outlet. With output modes that include variable wattage, temperature control w/ nickel, temperature cntrol with titanium, temperature control with stainless steel and a TCR mode, this mod is quite versatile. Power-wise, the maximum output is 200 watts, while the highest temperature capability is 600 Fahrenheit. And, the unit will work with atomizers down to 0.05 ohm during temperature operation and 0.10ohm during power mode. Although not listed in the specifications, the RX2 20700 is sure to be capable of ramp vaping with the ability to set initial wattage to your liking for the first 2 seconds. In the safety department, there’s a dual circuit protection system to assure a vape experience that is always safe.